This make-ahead breakfast uses the best of what's in season right now: blueberries, strawberries, and raspberries. Let the brea-and-egg mixture sit overnight to full incorporate, then bake in the morning and top with fruit and whipped cream. 1. Grease the bottom and sides of a 9-by-13-inch baking dish with butter. 2. Slice the bread into 3/4-to-1-inch-thick slices. If your bread is very fresh, lightly toast the slices before assembling. 3. Tile all the bread in the dish, each slice overlapping the next. 4. Scatter the blueberries over the bread, letting some fall to the bottom of the dish. 5. Whisk the eggs, milk, 1/2 cup cream, 2/3 cup granulated sugar, almond extract and salt in a medium bowl until the sugar is dissolved. 6. Pour over the bread and berries and press gently to help the bread start soaking in the egg mixture. 7. Cut the 2 tablespoons butter into small pieces and dot over the top of the casserole. 8. Cover with plastic wrap and let stand in the refrigerator 8 hours or overnight. 9. Preheat the oven to 350 degrees F. Remove and discard the plastic wrap. 10. Bake the casserole until golden brown and set in the center, 45 to 50 minutes, tenting with foil if the bread starts to become too dark. 11. Let stand 10 minutes. Dust with confectioners' sugar if desired. 12. While the casserole bakes, toss the strawberries and raspberries with 1 tablespoon granulated sugar in a medium bowl and let stand until juicy. Before serving, whip the remaining 3/4 cup cream with the remaining 1 tablespoon granulated sugar and vanilla until soft peaks form. 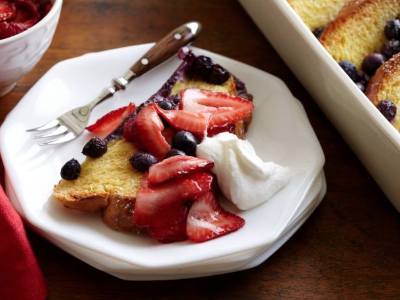 Serve the casserole with a dollop of whipped cream and a generous spoonful of the berries with their juices. A beautiful cabin in a beautiful place to relax and get away from the daily grind. The Cohutta Sunset exceeded our expectations by far! This was our first experience renting a cabin, and it was wonderful. The directions to the cabin were clear and easy to follow (and it was a great adventure going up the mountain... very happy we had our SUV!). The views from the cabin were breathtaking. Our son was thrilled to be above the clouds each morning before the sun rose! The interior of the cabin was beautifully decorated and maintained, and the cabin was spotless upon our arrival. We experienced two substantial night time thunderstorms while we were there. My husband and I both commented on how safe and sturdy the cabin felt, and how quiet it was during a very active storm system. We lost power at one point during the night, and I was very appreciative for the battery powered candle in the master bedroom! I was unsure how long it would take to restore power (being so far up), and was extremely pleased to find it back on by the time we got up in the morning. We will happily use Cabin Rentals of Georgia in the future, and hope to return to the Cohutta Sunset someday!